Surges and spikes on datalines can fry your communications boards and garble data. This article describes the operation, installation and selection of what is probably the most common method of dataline protection. Surge suppressors divert excess energy away from the port being protected into a ground connection. The operation of these devices relies on a high quality ground connection in order to safely shunt away unwanted energy. Shunting harmful currents to ground before they reach the data port is the job of components such as Transient Voltage Suppressors (“TVS” – often referred to by the trade name “Tranzorbs”), Metal Oxide Varistors (“MOV”) or gas discharge tubes. These devices all work by turning on at a set voltage. Once the clamp voltage has been exceeded, the devices provide a low impedance connection between terminals. These shunting devices are most often installed from each data line to the local earth ground and should be selected to begin conducting current at a voltage as close as possible above the system’s normal communications level. For RS-422 and RS-485 systems, the voltage rating selected is typically 5 – 7 Volts, in RS-232 systems 12 - 15 Volt devices are appropriate. These devices typically add some capacitive load to the data lines, similar to adding additional cable to the system. This should be considered when designing a system by reducing the total allowable line length, if possible. Several hundred meters/feet is usually an adequate figure in RS-422 and RS-485 systems. While transients may not always conform to industry specifications, both the Institute of Electrical and ElectronicsEngineers (IEEE) and the International Electrotechnical Commission(IEC) have developed transient models for use in evaluating electrical and electronic equipment for immunity to surges. These models can offer some insight into the types of energy that must be controlled to prevent system damage. Both IEC 1000-4-5: 1995 “Surge Immunity Test” and IEEEC62.41-1991 “IEEE Recommended Practice on Surge Voltages in Low-Voltage AC Power Circuits” define a “1.2/50ms - 8/20ms combination wave” surge which has a 1.2 ms voltage rise time with a 50 ms decay across an open circuit. 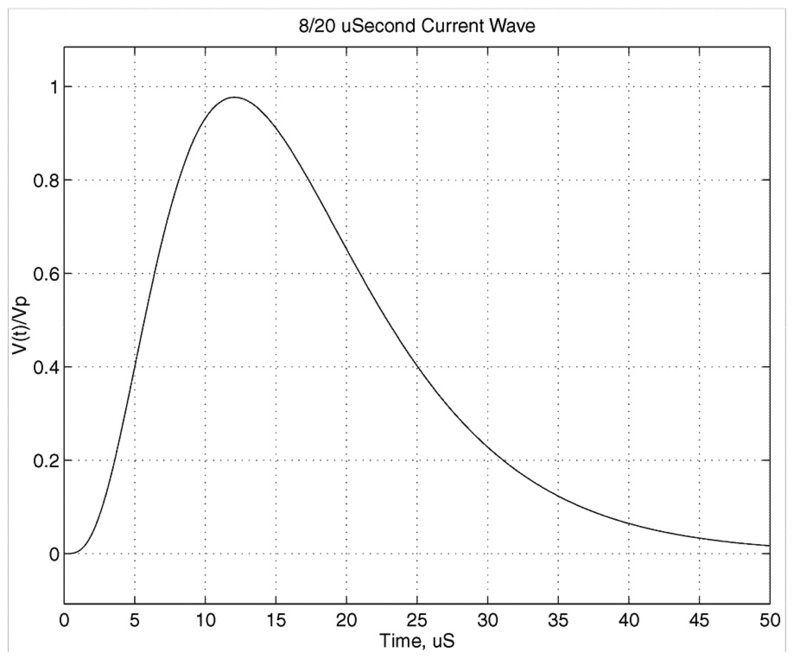 The specified current waveform has an 8 ms rise time with a 20 ms decay into a short circuit. Open circuit voltage levels from 1 – 6 kV are commonly used in both the positive and negative polarities, although under some circumstances, voltages as high as 20 kV may be applied. Figures 1 and 2 illustrate the combination wave characteristics. In addition, IEEE C62.41 also specifies a 100 kHz “ring wave” test. 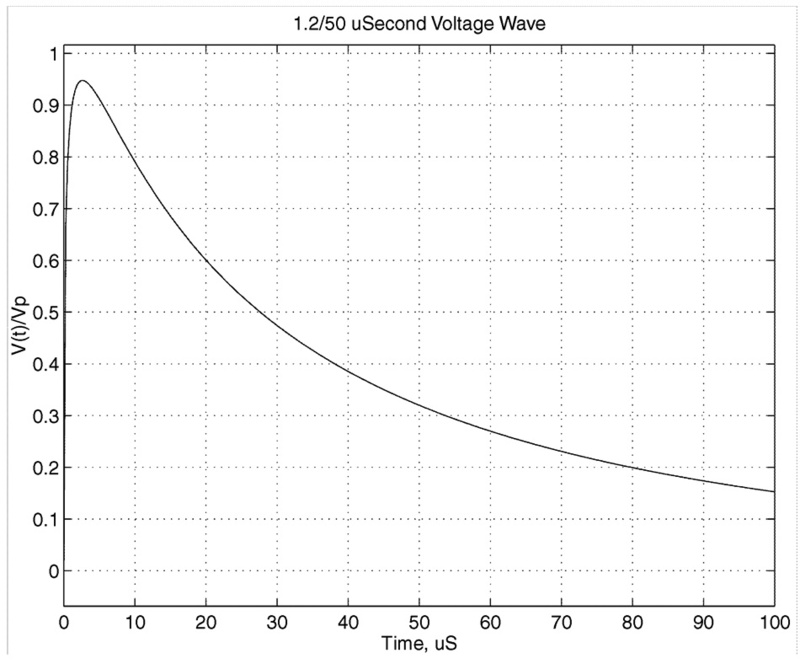 The ring wave has a 0.5ms rise time and a decaying oscillation at 100 kHz with source impedance of 12W as shown in Figure 3. 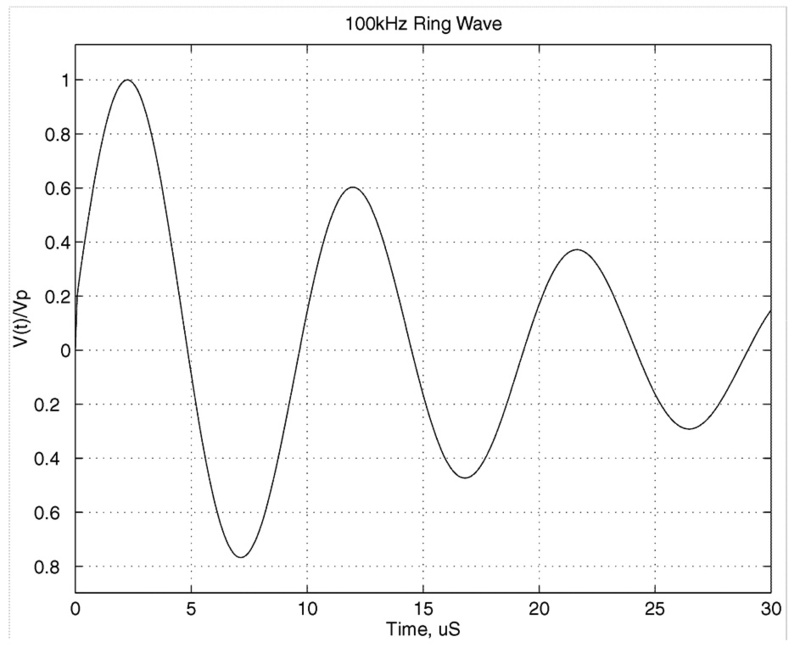 Typical amplitudes for the100 kHz ring wave also range from 1 – 6 kV. Surge suppressors must be installed as close to the port to be protected as possible and must have an extremely low impedance connection to the local earth ground of the unit being protected. This ground connection is crucial for proper operation, providing a shunt path for excess energy as well as a ground reference at the same potential as the host. In most cases, this means the ground connection should be made from the surge suppressor directly to the chassis of the host device. The impedance of the ground connection is critical. The voltage presented to the data port is equal to the clamping voltage of the surge suppression device plus the voltage drop in the suppressor’s ground path to the node being protected. Any voltage drop in the ground connection will effectively increase the clamping voltage seen at the data port. Transient currents can be very large,with magnitudes measured in thousands of Amps. At these current levels, the DC voltage drop (IxR) can be very large. For example, 1.8 meters (6 feet) of 18AWG wire has approximately 0.039 W resistance. Although this initially appears to be a good ground connection, calculating IxR with a 3000 Amp transient yields a voltage of 117 Volts across the ground wire – enough to destroy any data port. To make matters worse, at the frequencies illustrated in Figures 1 – 3, the inductance of the ground wire causes an additional voltage drop that can be much higher than the IxR voltage drop. To minimize this voltage drop, the ground connection should be made with heavy gauge wire and kept as short as possible. If the cable must be longer than one meter (3.3 feet), braided cable intended for grounding purposes must be used. Two basic types of surge suppression products are available as illustrated in Figure 4. In either case, the system designer should consider the clamping voltage of the unit as well as its physical attributes, such as connector type and method of making the grounding connection. The most common device uses a single TVS or MOV for each protected line. This type of unit is usually small and inexpensive. If a proper ground connection is made, they should offer protection against most transients. A disadvantage of this device is that, if a large transient damages one or more of the components, there often is no indication that the unit has failed, leaving the node unprotected against future transients. More advanced units use three components on each protected line to handle much larger surge currents and to provide internal self protection, reducing the risk of undetected failures. The first stage is a gas discharge tube; this stage can shunt very large currents, but is slow reacting and requires a relatively large voltage before conduction begins. The second stage is series impedance; this stage limits the current flowing into the final stage of the circuit. Finally, a TVS device clamps at a voltage acceptable for the data port and maintains the clamp until the gas discharge tube begins conduction.